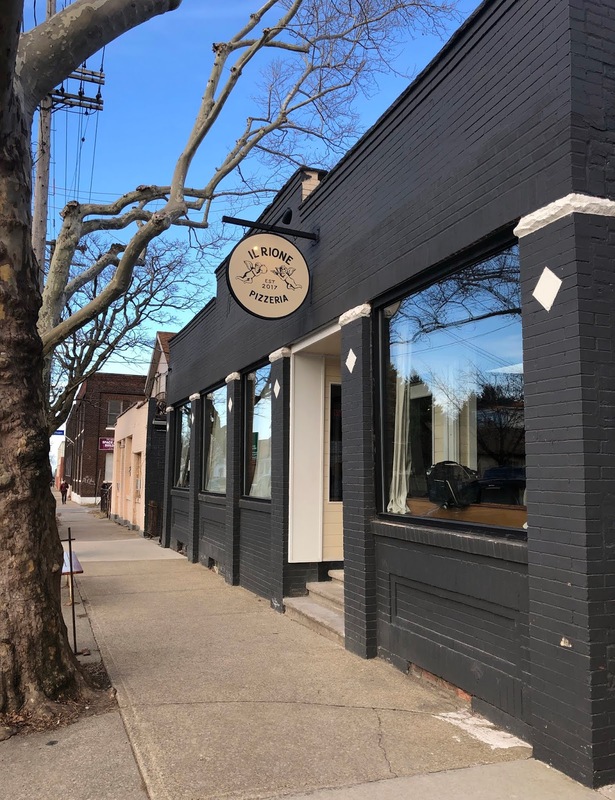 I finally headed to Il Rione Pizzeria in Cleveland's "West Side Little Italy" for the New York-style pizza that everyone has been raving about since it opened in 2017. 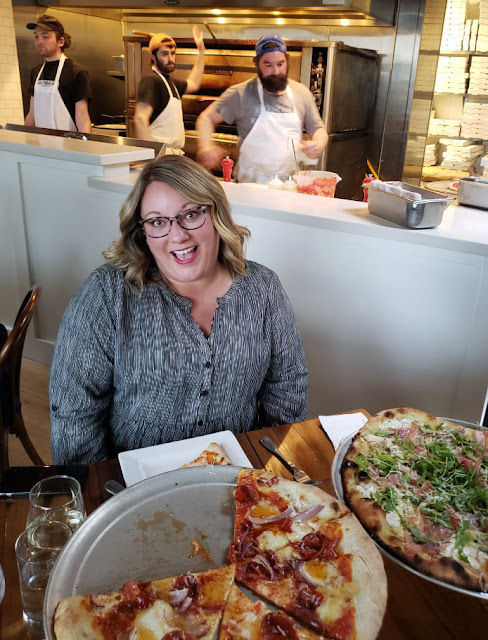 I wasn't only excited to finally try this pizza, but also to kick off the first stop of my 2019 To Dine Challenge! This cozy Gordon Square neighborhood spot is right across the street from Stone Mad, and has a funky, cool vibe to it with exposed brick and industrial elements with warm tones and an open kitchen concept. On weekend nights in particular, be prepared to wait, as it has a decent amount of seating, but not enough to accommodate its popularity. We were fortunate enough to arrive ahead of the dinner crowd and snag a table right next to the kitchen, for views of the pizzas being made. We started off the meal with salads, and I got the House Salad ($7) with romaine, balsamic vinaigrette, goat cheese, roasted sunflower seeds, and fried capers. Those fried capers! Then we split two small pizzas between the three of us, and only one slice was left standing. You can build your own, or select from the Suggested Pies. We leaned towards the suggested combinations, and ordered a Roseanna Pie ($17)- white pie, red onion, prosciutto, and arugula. And a Diavolo Pie ($17)- red sauce, mozzarella, calabrian chiles, spicy salami, and red onions. But we added the Hot Honey from the Speck Pie to it, and it was the perfect sweet and spicy addition! I am completely addicted to chile-infused honey on pizza after our January trip to NYC when I tasted it for the first time. A bottle came home with us. I would totally eat the Roseanna again, but that Diavolo left my mouth watering and I'm craving it again soon. For me, the center of this style of pizza is often so thin that it gets too wet for my personal taste, but man once you get a few bites in then it's golden! 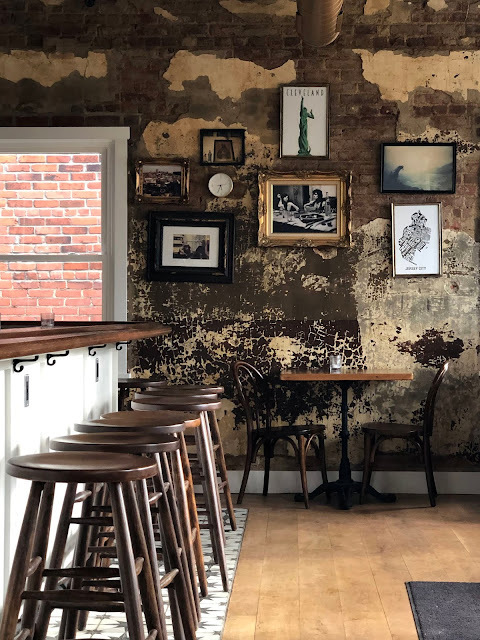 This spot is family-friendly, but also has some great adult beverage options. I was turned on to a new grape varietal that I hadn't tried before thanks to our server, and enjoyed two glasses of wine with our meal. Our men were not invited to this girls' dinner, but we snagged some pizzas to-go and scored wifey points at home. It was almost as good as takeout! I am honored to have had the privilege of kicking off this year's challenge with you! You're off to a delicious start! The soggy center had me doubting the awesomeness of Il Rione, but after a few bites - I'm a true believer. Amazing! Thank you for a fabulous night. Ah, man, I loved my one visit to Il Rione & need to get back, STAT. These two pizzas both look & sound right up my alley! You always make a great partner in crime for these outings! Still thinking about the Diavolo! I’d like to try building my own version next time. Yum! We had a date night here a month or so ago and it was amazing! Definitely our favorite sit-down pizza restaurant in Cleveland! And Stone Mad pub across the street was a great place to wait for the table!